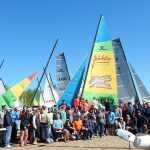 This year was Madcatter number 41 and while not an anniversary the fleet still organized the same event that has proven to be a success. 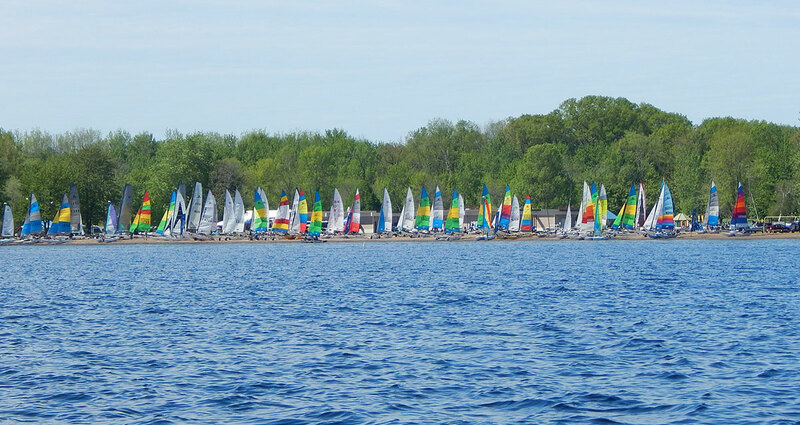 This year’s theme is “race dance repeat” which is a pretty good three word summary. 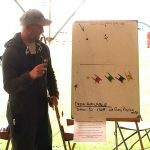 Three days of activities with social events each night and lot of food is the draw. 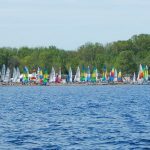 Sailors travel long distances for this and this year was no exception with teams from Florida and Washington State. 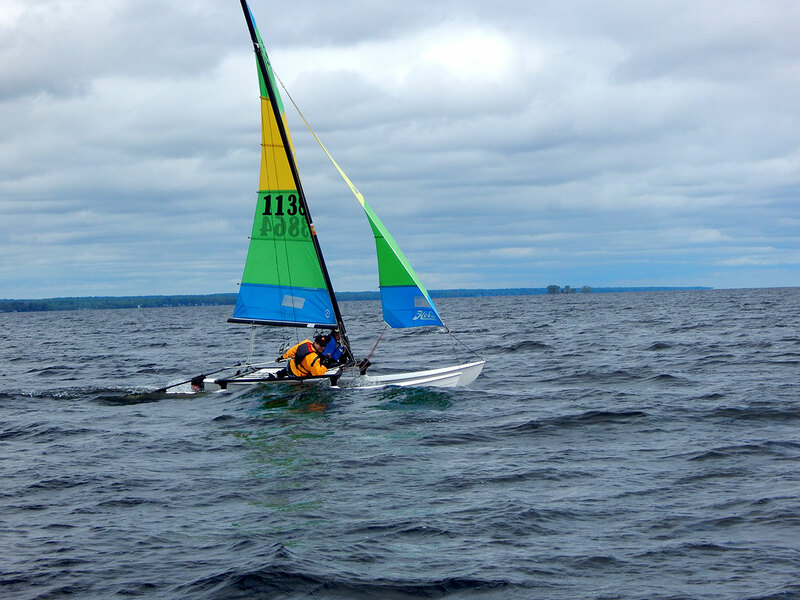 Friday’s activities included a guest expert program (GEP) and a distance race. 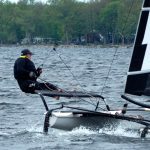 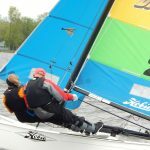 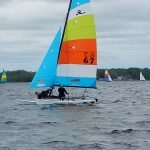 The guest expert program is a racing seminar run by one of the top sailors in North America, the format varies and is modified to fit the needs of the participants. 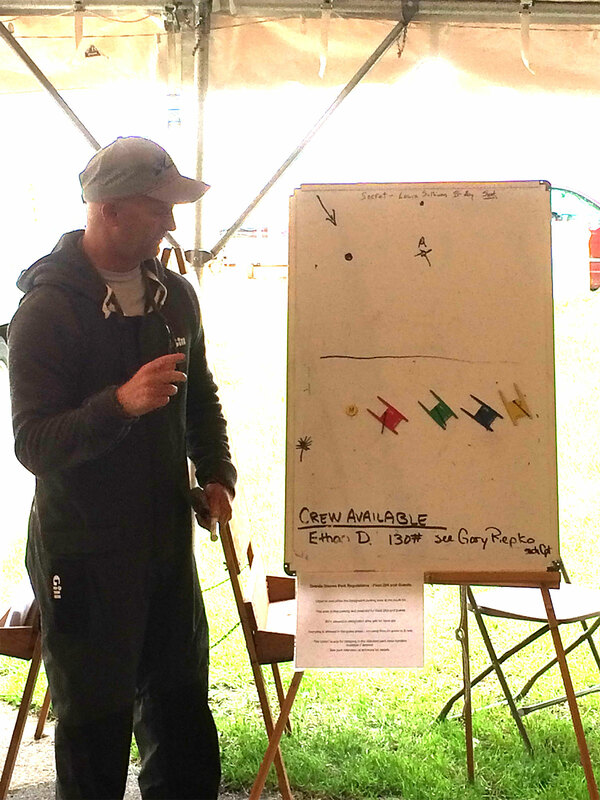 Tom Korzeniewski led the GEP seminar this year. 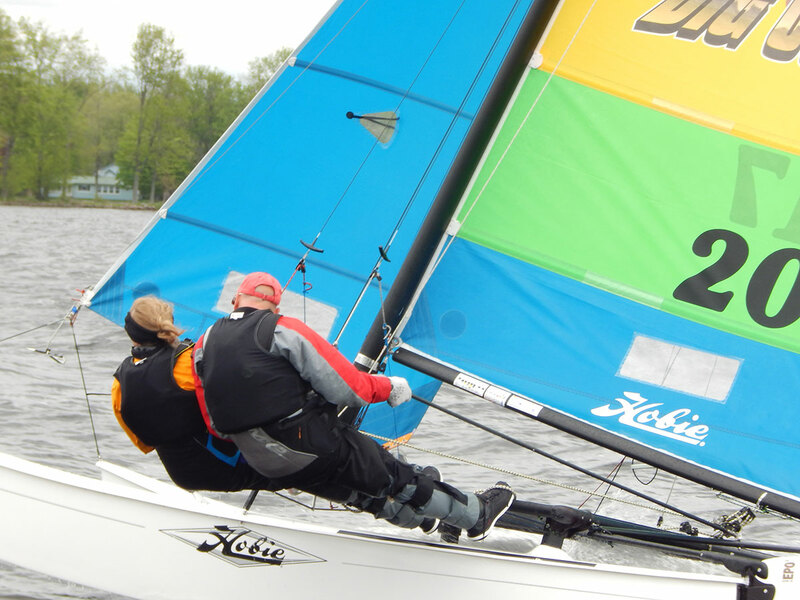 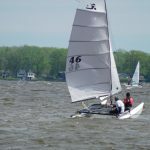 Topics ranged from the new rules, to tactics and boat rigging techniques for different wind conditions. 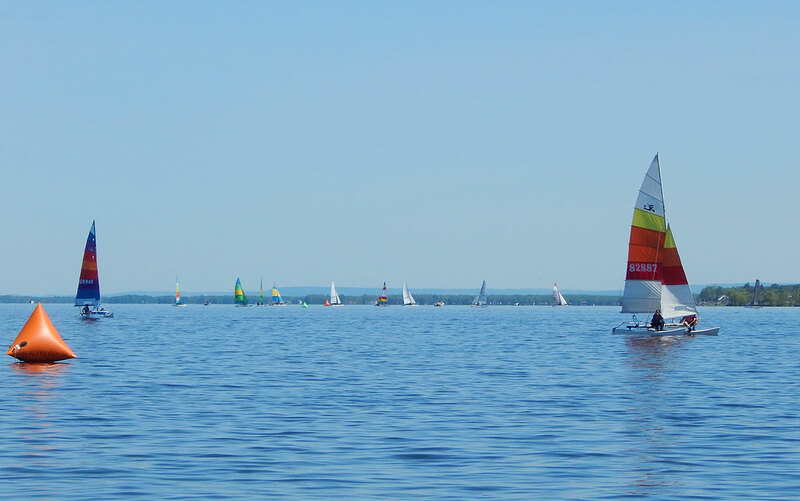 Lake Oneida is 32 kilometres long and 8 kilometres wide with some islands in the middle. 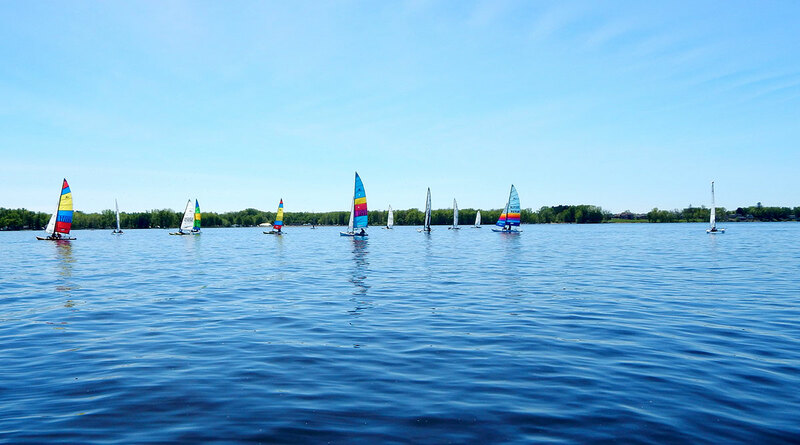 The typical buoy racing area is at one end near the launch area and the islands don’t come into play. 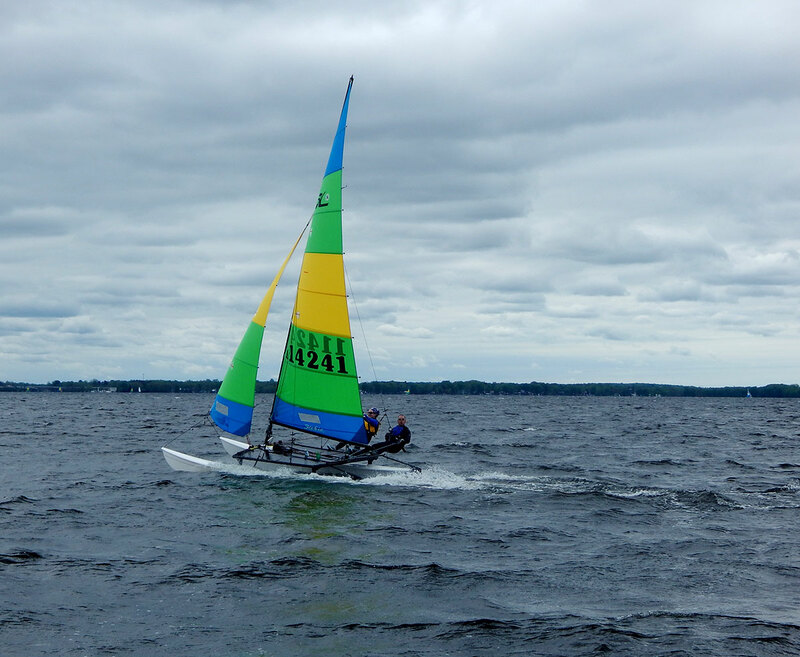 The distance starts near the launch area goes upwind to a channel marker, long downwind that rounds the islands and another channel mark, followed by a long upwind back to the first buoy and a short downwind to the finish (about 16 kilometres overall). 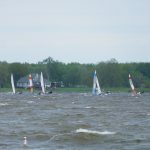 Twenty boats competed in the distance race which started in 10-12 knots but built to a puffy 15-20+ for the second half. 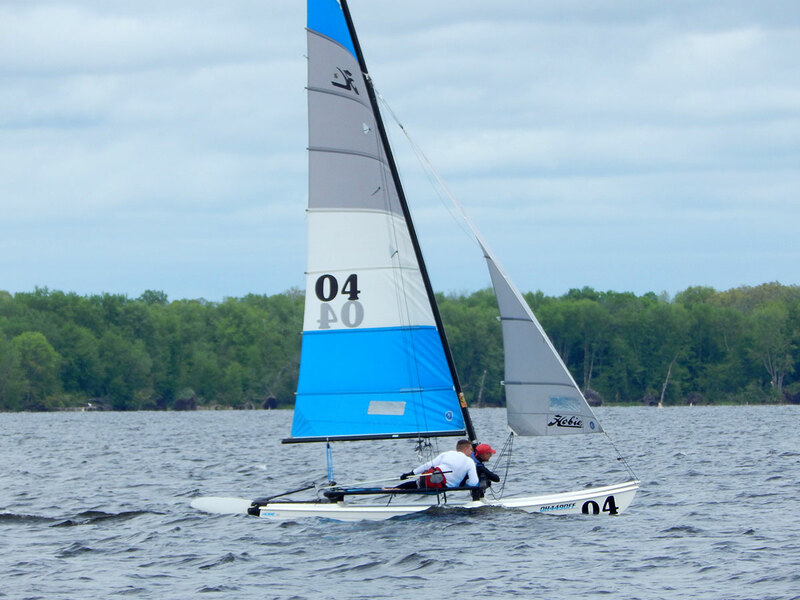 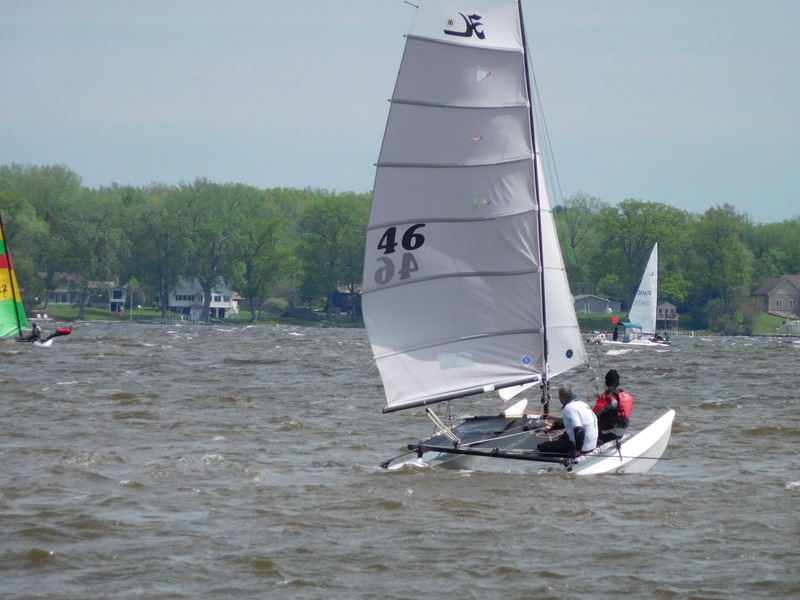 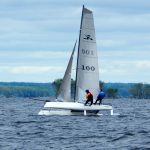 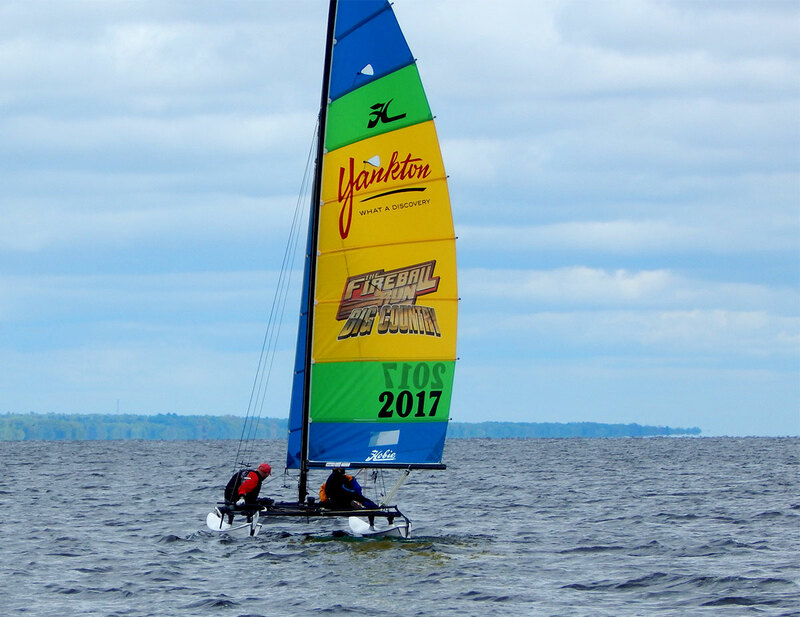 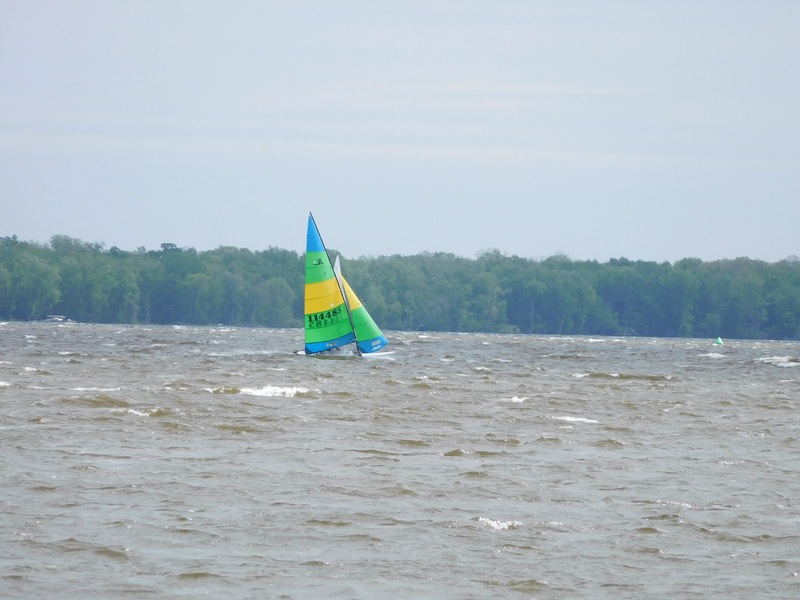 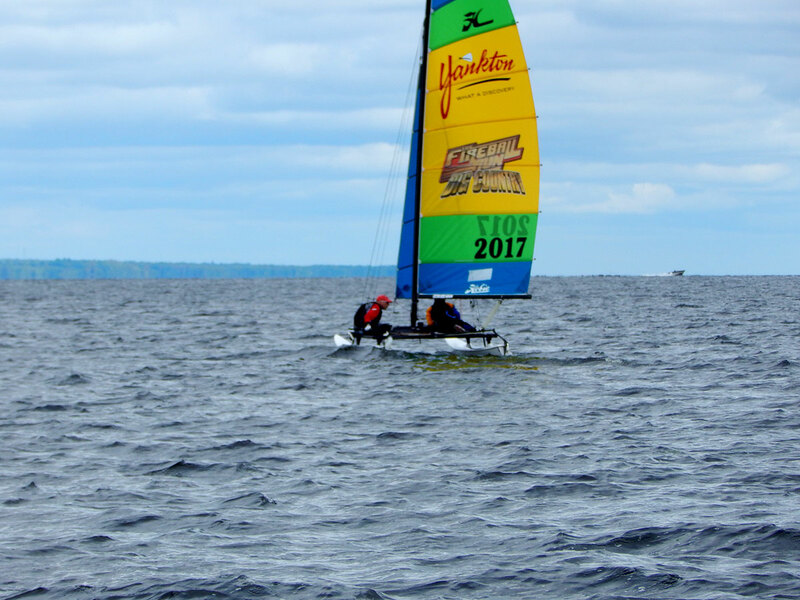 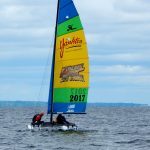 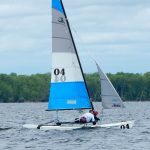 A Wildcat sailed by John Anderson and Bob O. won line honors but was shortly followed by the first Hobie 16 sailed by Rich and Carol McVeigh sailing the Yankton, SD sponsored boat. 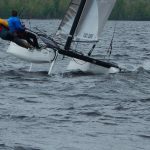 The rest of the sailors arrived Friday afternoon and enjoyed a hot dinner under the tent. 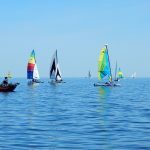 Buoy racing starts next and will race Saturday and Sunday. 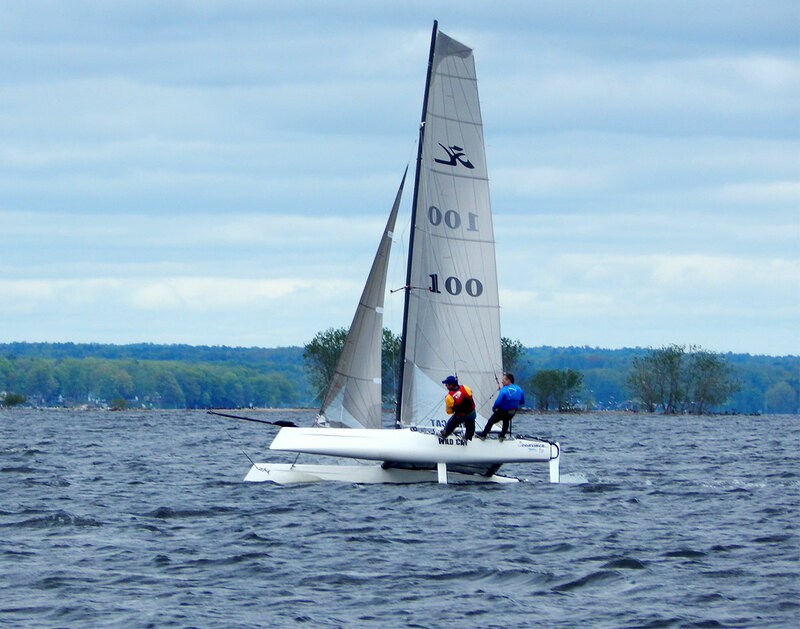 One of the fun things about the Madcatter is the level of competition, particularly in the 16 fleet. 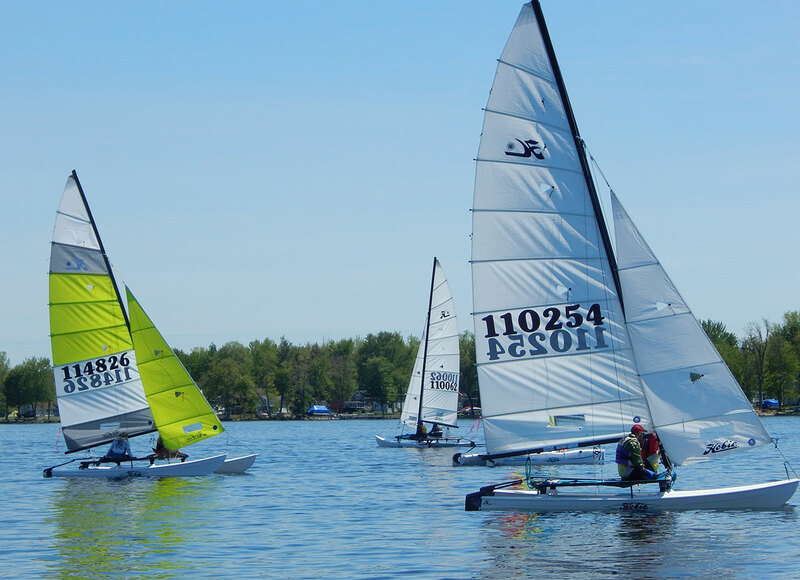 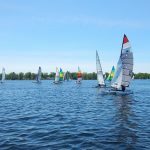 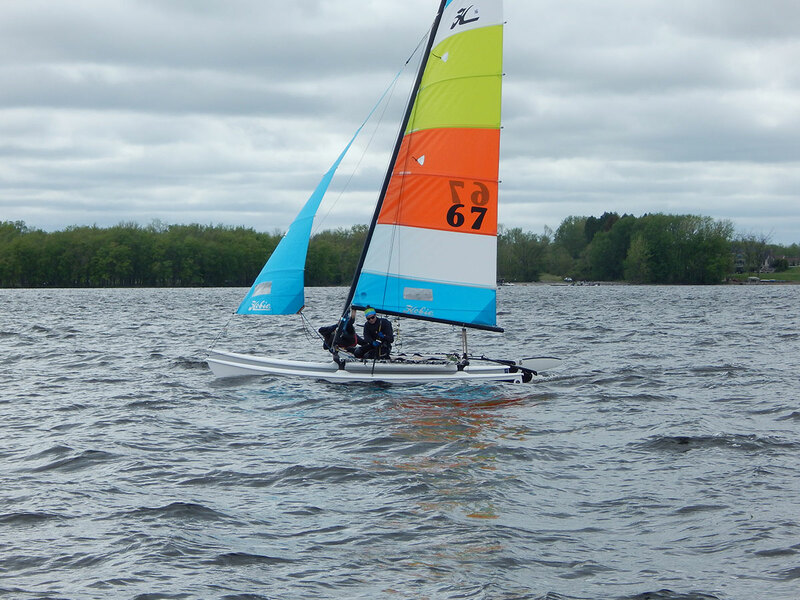 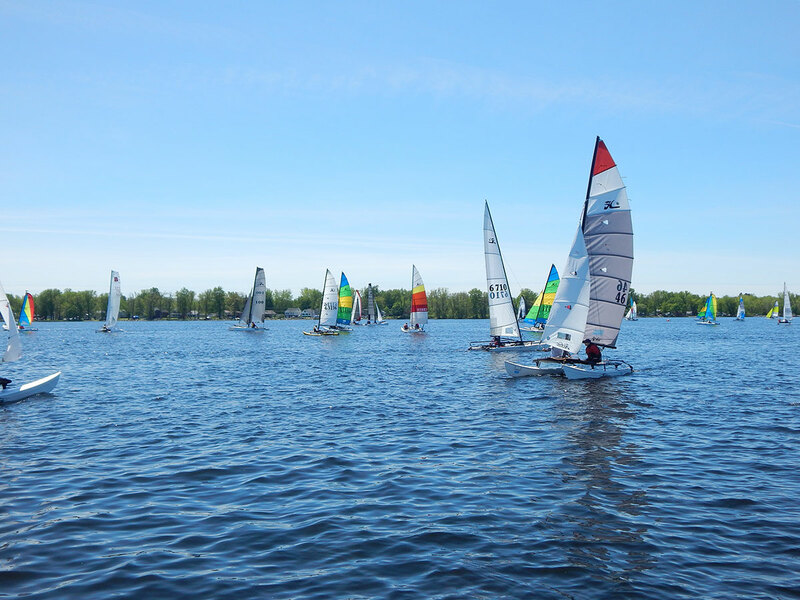 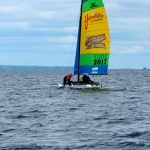 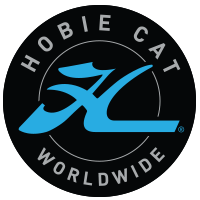 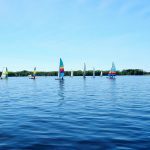 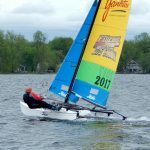 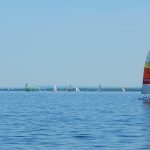 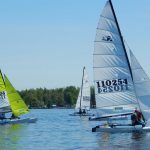 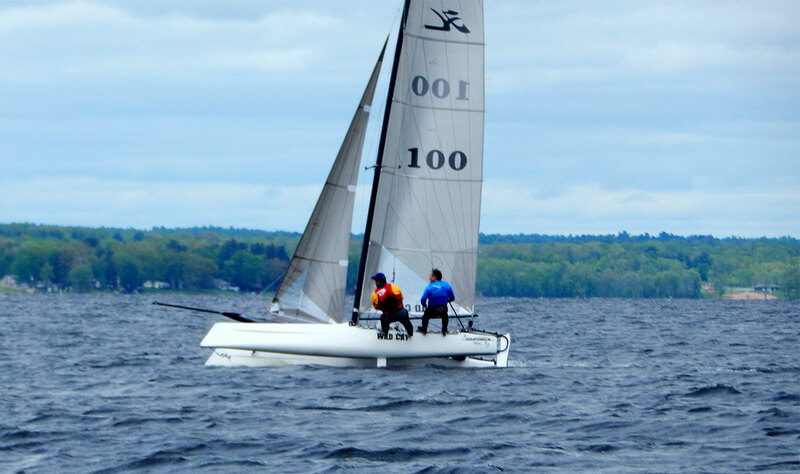 This lake is the home of Fleet 204, they have over 50 families in the fleet and they are supported by a close relationship with the local Hobie dealer (Boatworks Ltd.). 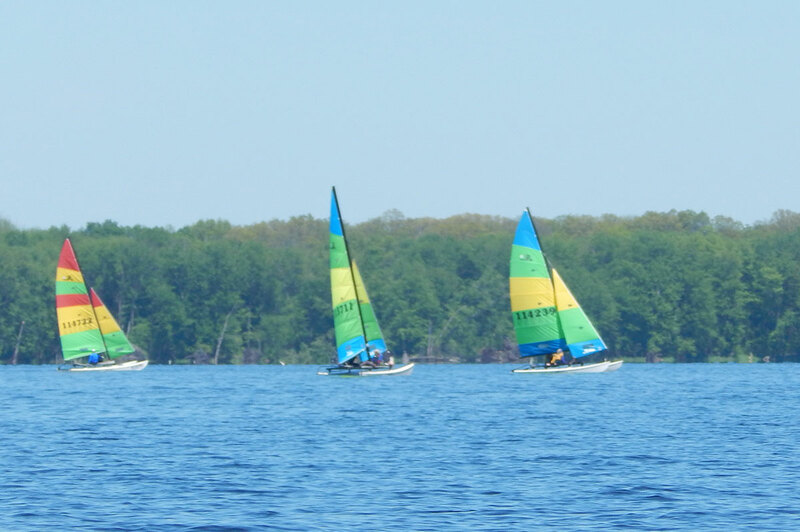 The fleet keeps their boats at a property on the water and races every Thursday night in the summer. 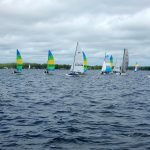 They typically have over 15 boats participating in their Thursday night races. 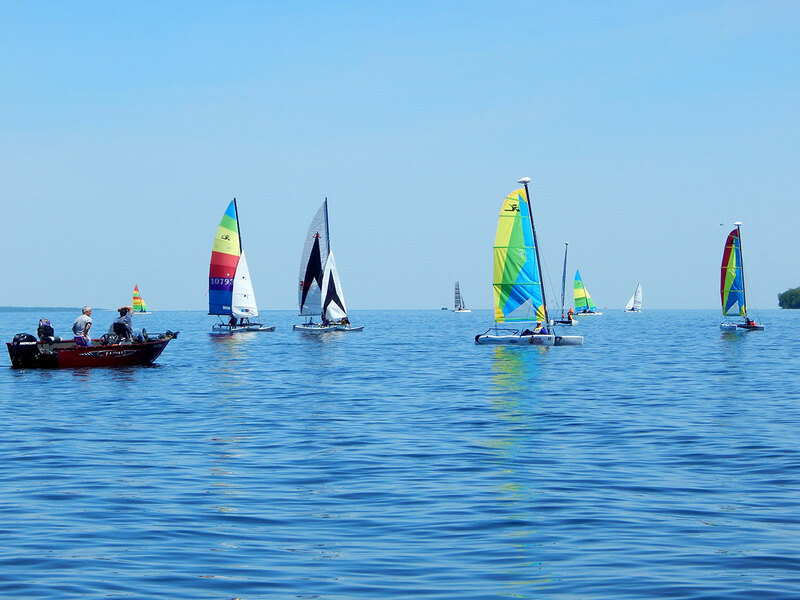 As you can guess, they are all very good and have a lot of local knowledge. 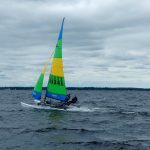 The first day of buoy racing was in light winds (1-6 knots), the races always started in good wind but at times it would drop off and get slow. 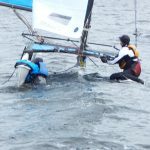 Despite the light wind the races were still quite good and those that could manage the fleet and the conditions did well. 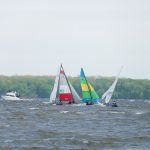 The last race of the day was the toughest as the wind really shut off for the end of the race forcing a shortened course. 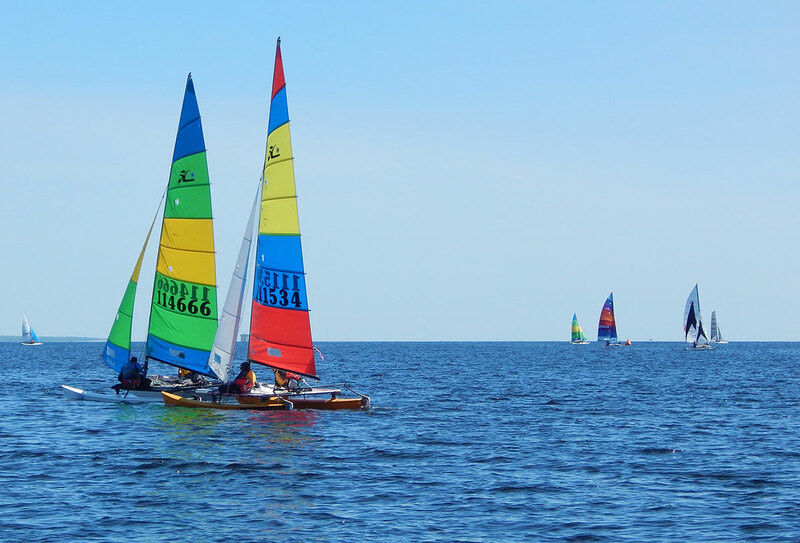 Following the conclusion of racing, we all drifted our way back to the beach. 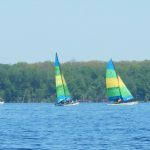 While everyone waited for dinner, there was a lot of socializing around the beer truck. 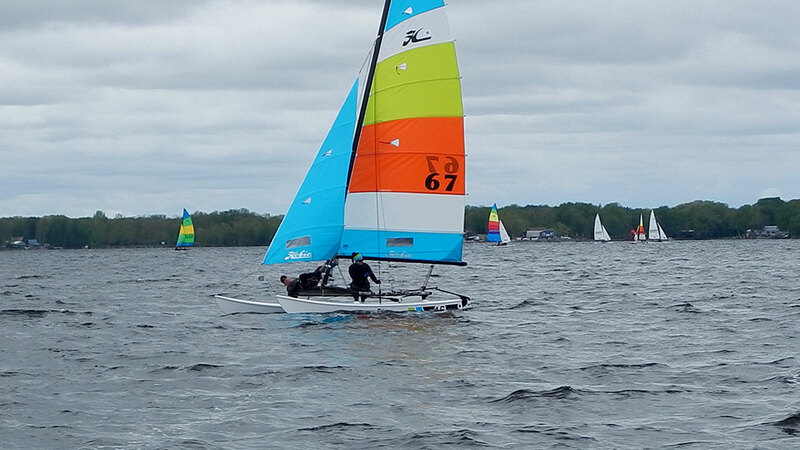 After dinner the fleet bar (made from a Hobie 16 hull) was set up and the “rum squall” and dancing began. 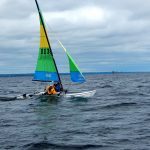 Several people tried to become honorary bar tenders and were denied, seems there are rules! 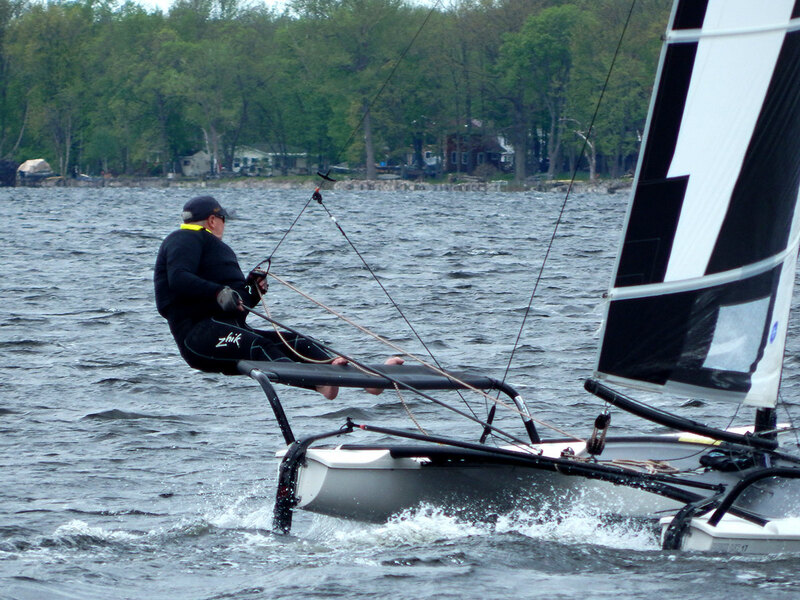 Racing continues on Sunday with stronger winds forecasted. 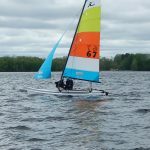 The Madcatter has a reputation for being cold and windy but for the last few years it’s been warm with light to moderate winds. 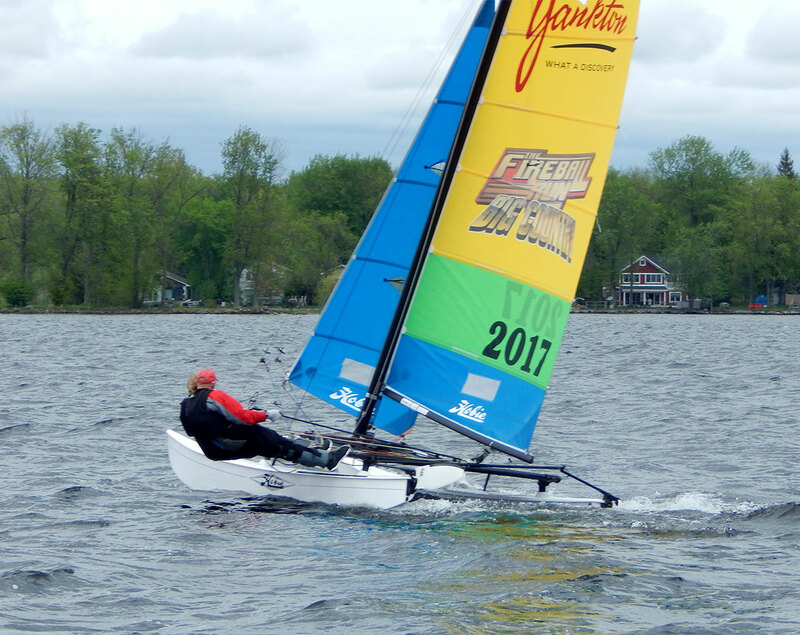 For the final day of racing, we were reminded of the Madcatter’s reputation. 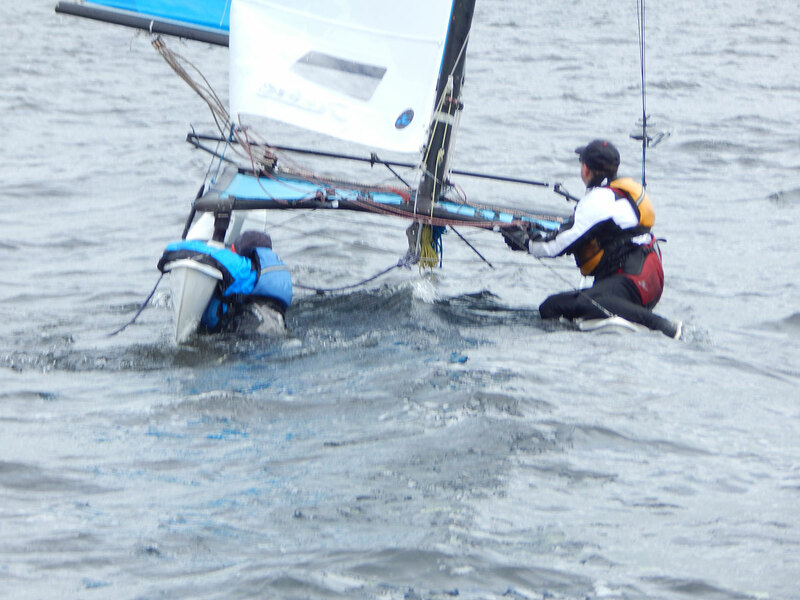 Cold temperatures and strong winds greeted sailors Sunday morning. 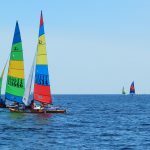 The race committee postponed for approximately one hour to let the temperatures come up a bit, while they accessed the wind. 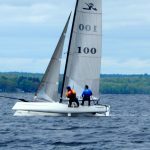 The sailors mostly stayed under the tent where the big heaters were running and listened to a talk by Wally Myers on heavy wind sailing during the postponement. 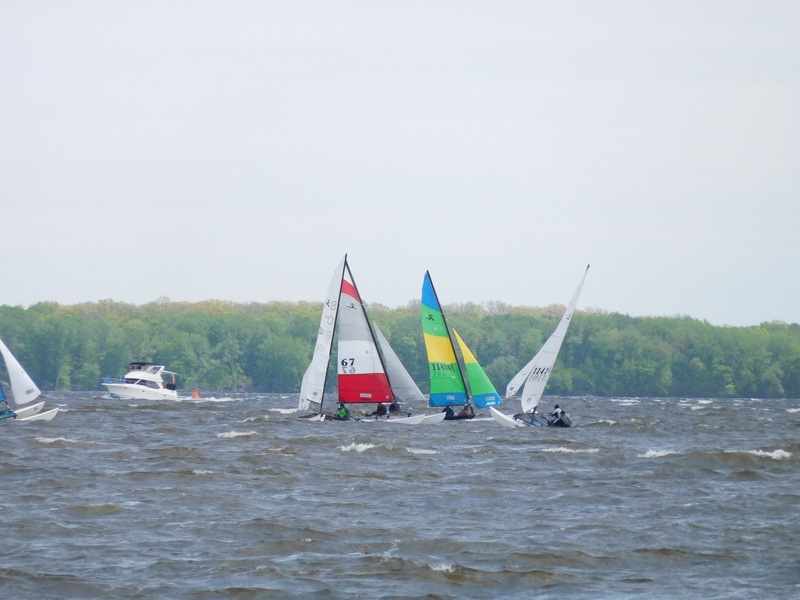 With many sailors electing to sit today out, two races were sailed in 20-30 knots. 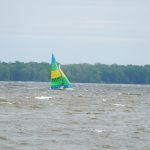 The wind was blowing the full length of the lake which created a lumpy wave state, at least for a lake. 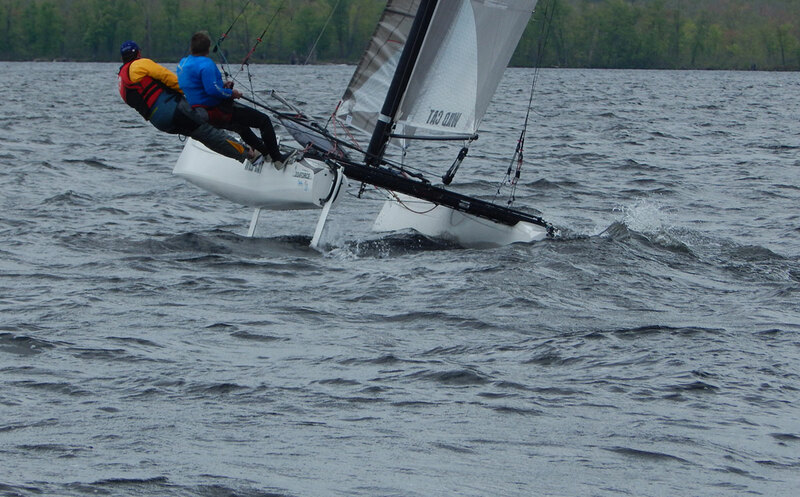 The chase boats had opportunity to scoop up a couple crews that became separate from their boats. 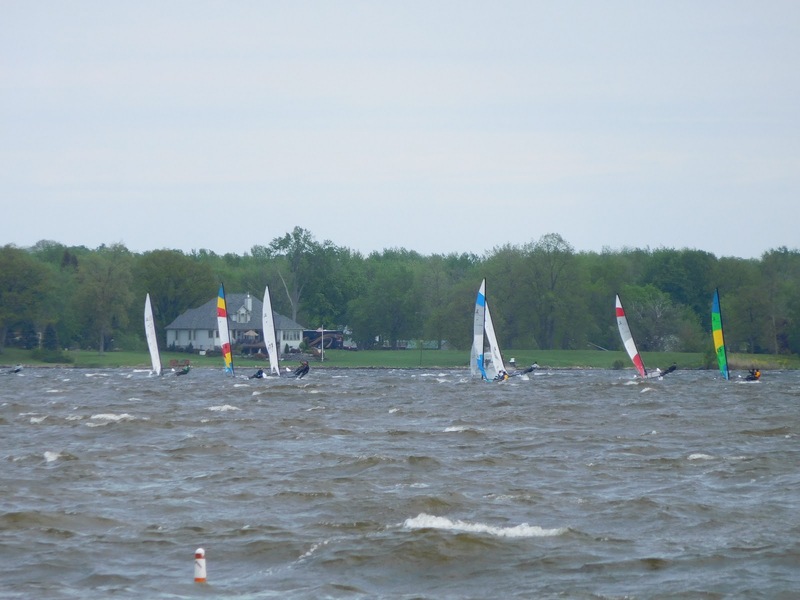 Meanwhile there were some tight battles as the big wind teams were enjoying the conditions. 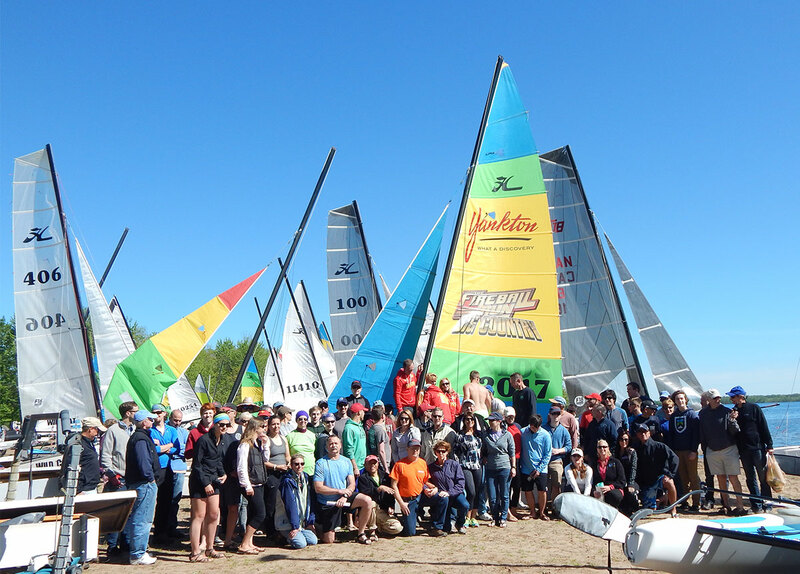 Following racing all the sailors enjoyed a hot meal during trophy presentation before starting their travels home. 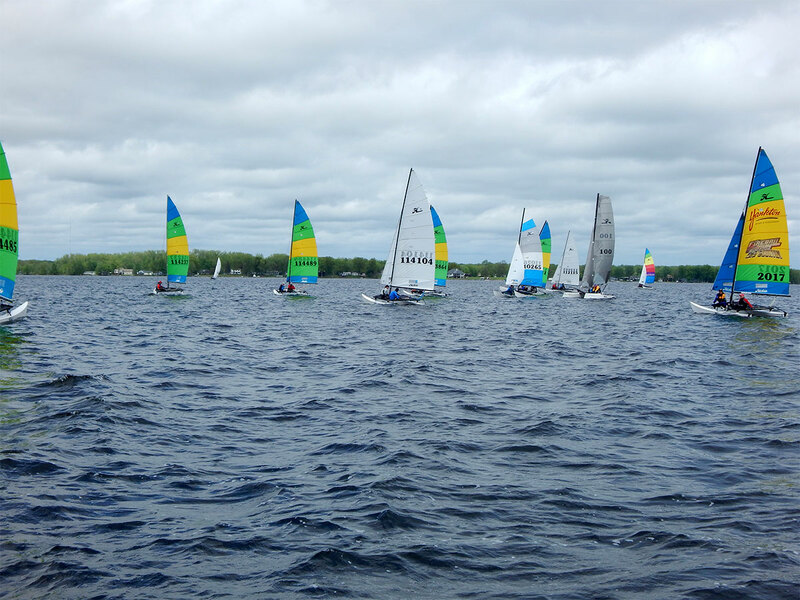 Thanks to Fleet 204 and their sponsors for another memorable event, we’ll see you next year.